The Technopark is located in Ons City, 09 kilometers from the city Center and separated by only 300 meters from the highway Sfax / Tunisia (2 hours and a half) and the ring road adjacent to No. 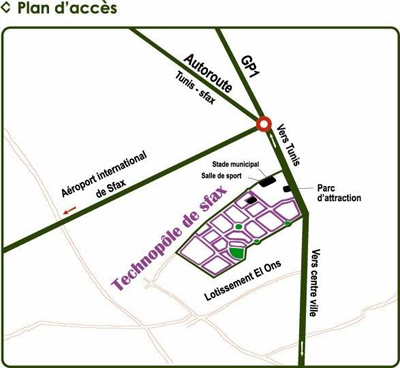 11 leading to the international airport Sfax-Thyna (10 minutes). Technopark is located at the entrance to the motorway linking the capital, Tunis, Sfax, passing through the main tourist cities, Sousse and Hammamet in the north and Djerba and Zarzis on the coastline, linking the south in the direction of Sfax the most important cities: Tozeur, Douz, Matmata, Tataouine and Guebeli to discover the desert.